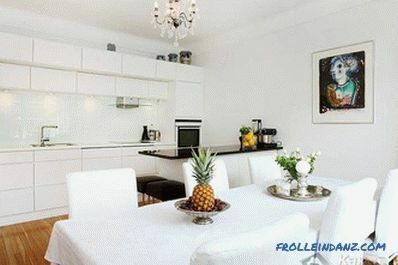 Traditionally, the kitchen prepares food, and in the dining area it is accepted. 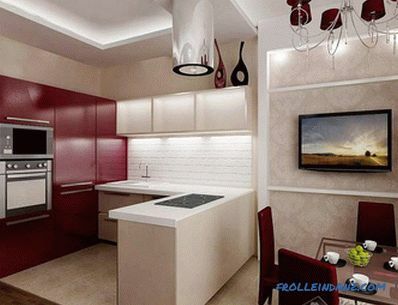 However, in most apartments the area of ​​the kitchen room is so small that it is impossible to turn around on it. It's good if there is a room where you can set up a table for meals. If not, then it's just a disaster. Recently, many people are thinking about how to combine the kitchen with a dining room or living room and expand the room. 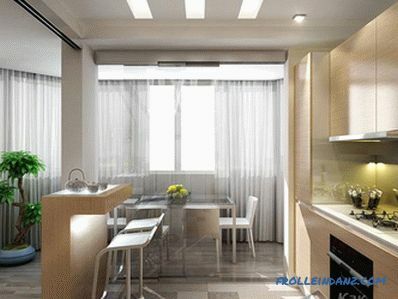 Redevelopment Project A kitchen combined with a dining room will have a lot of advantages. However, in order to connect the two rooms, it is necessary to tear down the wall. For this, first of all, permission will be required. If the wall turns out to be bearing, then research and design will be required. Only after the completion of the paperwork will it be possible to get to work. The best option for most families is to contact some private construction company, where they will develop a project to demolish the wall. 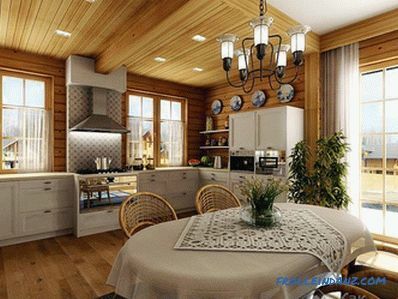 The interior of the kitchen-dining room should be made by special rules. Both rooms should not be visually mixed. 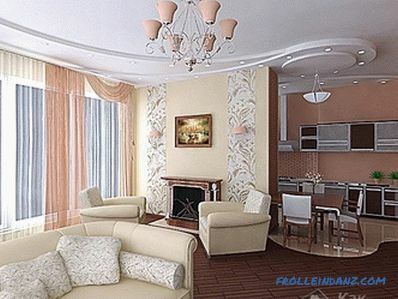 Of course, their combination will visually increase the area of ​​both rooms. However, there must be a difference between them, a border. To do this, it is necessary to conduct a clear zoning in the interior. Kitchen with dining area The most relevant solution is to place a bar counter between the kitchen and the dining room. 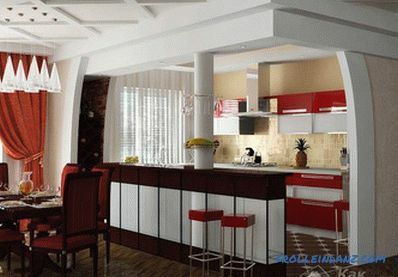 By the way, this option is perfect for combining the kitchen with the living room. On the side of the dining room at the bar you can put high bar stools. 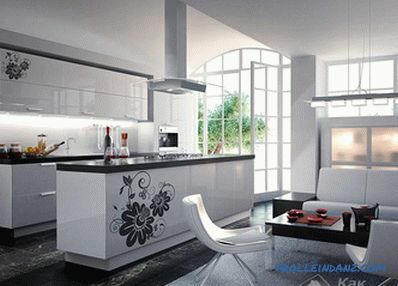 The design will close the various kitchen and household appliances and emphasize the individual image of the room. 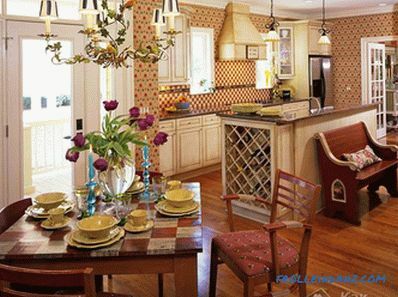 Visually separate the kitchen and dining room with the help of colors. 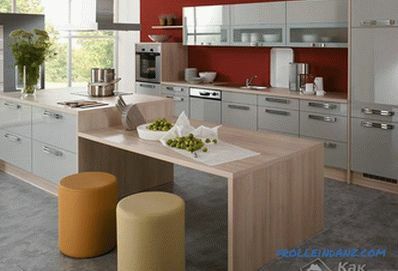 In the kitchen it is necessary to arrange the decoration of one color, and in the dining room of another. 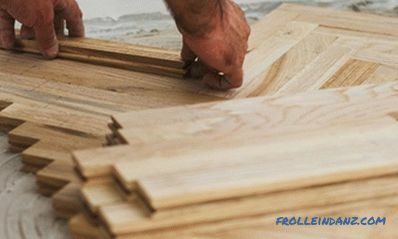 You can also make a different flooring. 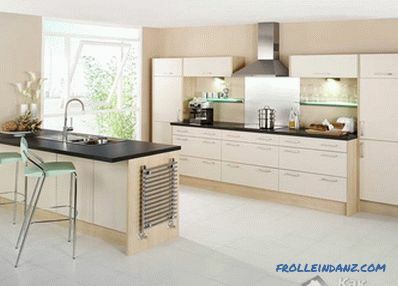 So, in kitchens the tile already familiar to everyone looks great. But in the dining room is better to use more presentable material. It is possible to divide the room and interior partition. If necessary, it can be moved apart. However, it still can not do without other interior solutions. 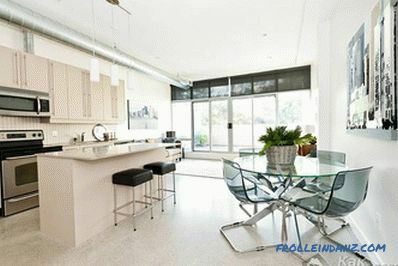 If the kitchen slightly raises the floor, then such a move also visually highlights this zone. 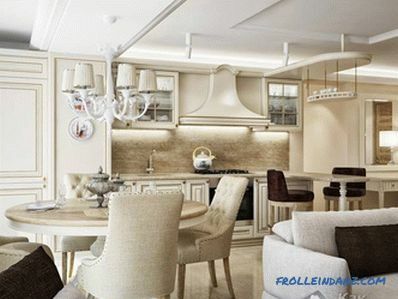 It is possible to divide the kitchen from the dining room with the help of light. In the dining room is usually installed one strong light source. It can be a beautiful big chandelier. In the kitchen it is better to make a few spotlights. Kitchen Layout - Dining room would satisfy the requests of most people. However, it happens that there is simply no dining. In this case, there are several solutions to the problem. Combine the kitchen and living room. Make the connection of two rooms can also, as in the case of the dining room. The same bar counter or partition can act as a zoning partition. Joining works require the same effort: reconciliation, wall demolition and new renovation. The only thing that needs to be done is to establish a new accent in the living room. Otherwise, all attention will focus on the bar. To do this, you need to place in the room a large home theater and a fairly bright sofa. Another option is to save space in the kitchen itself. Here it is necessary to approach wisely. 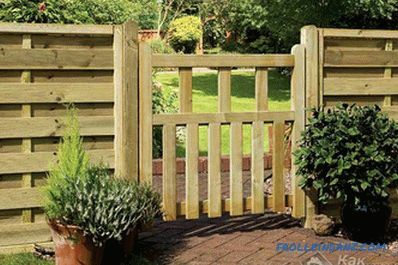 There are two solutions to the problem, and none of them will require the demolition of walls or major repairs. Even if the owner has a dining room combined with a kitchen, one of the options described below may be useful for him to create more space. To free up space, Transformers and compact furniture can be used. 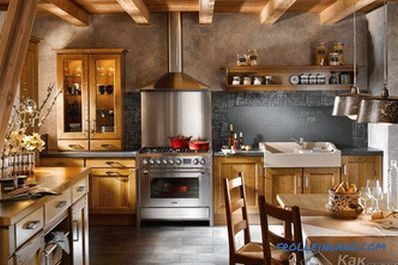 It is not necessary to place a huge stove in a small kitchen, which will immediately take away most of the space. Here the tile for two burners, tabletop and modules of the table and chairs fit. Indoors, you can pre-select the dining area. 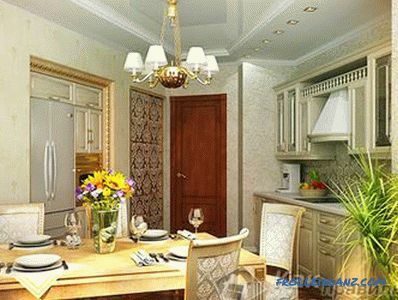 However, most likely, you will have to collect the kitchen to make room for dining, and vice versa. 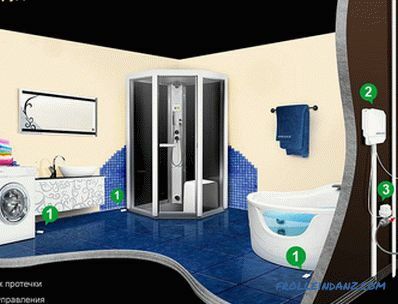 This solution is suitable even for very small spaces. 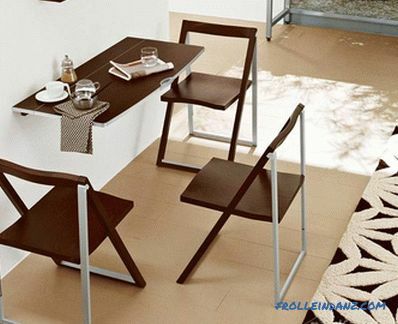 For the second type of interior you will need One indispensable part is the table with the assembly function. It should be located in the middle of the kitchen. 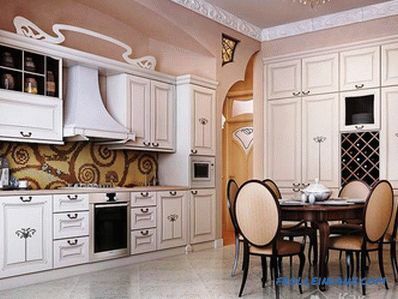 In one part of the room there is a dining area, and in the second half is the most common stove and cabinets. When you need to prepare food, you just need to turn the table so that its lid does not interfere with the hostess. You can really increase the space. 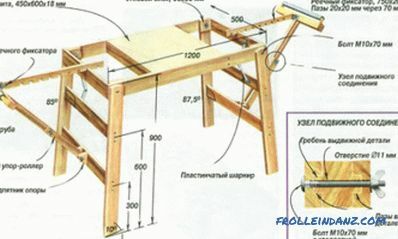 This, for example, will help the dining room, combined with the kitchen. And you can increase the room visually.For this, there are some design secrets. A light tone finish. Light walls (especially pastel colors) visually expand the space. Therefore, you can make the kitchen tiles of this color. Large figures constrict space. When finishing it is better to choose materials with small patterns. If the kitchen has a very low ceiling, then a vertical strip finish will visually lift it. If you need to expand the room itself and increase the length of the walls, then you need to make a horizontal strip in the decoration. Do not hang heavy curtains with lambrequins in the kitchen. They create a feeling of tightness and are well suited only for large rooms. It is better to take light curtains of a light shade with small patterns. 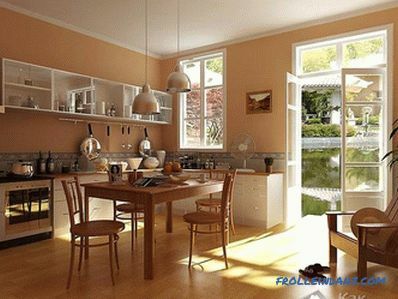 You can visually enlarge the kitchen with the help of a mirror. It is known that it doubles the space. True, do not abuse this effect. If you combine all the ways to increase the space, you can create a fairly spacious room. Design subtleties allow you to make even the smallest kitchen functional and comfortable. 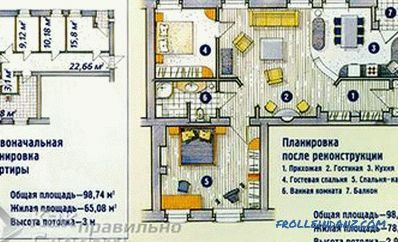 Separately, it is necessary to say about the design of the interior in a particular direction. Such a style as high-tech, just created to solve problems with space. Glass surfaces, chrome, metal and a lot of light - this is the recipe for space in the kitchen and in any other room. True, many apartment owners do not use it because of some “coldness”. Instead of high-tech, you can successfully use modern.